The South Australian government has released its draft ICT policy, SA Connected, for public consultation via the SA Plan consultation site. In what may be a first, the plan is available in ePub format for eReaders, although there's no HTML version and consultation is only via email reply. We want to embed a new culture of innovation between government agencies, and between government and industry. Using and improving technology allows us to break down barriers that have previously prevented us finding shared solutions to common problems. To improve our ability to innovate, we will work more closely with industry to develop a practical and sensible framework for introducing new technologies into government. It also recognises the need for the public sector to work in a co-ordinated manner, not simple as agency silos, and to employ an agile and iterative approach to ICT. SA Connected also neatly uses personas to portray the potential future uses of ICT in government by 2030 - presenting a very positive view of how it could enable citizens and agencies. There's also some very positive short-term improvements outlined, with real-time Adelaide Metro information becoming progressively available in 2013 for buses, trams and trains. Also a whole-of-government collaboration platform, StateLink, is being rolled out, incorporating instant messaging, desktop videoconferencing, meeting spaces and desktop and application sharing. The boldest goal in the plan is to move to digital by default and collaborative democracy - placing citizens at the centre of government and digital at the centre of the web of channels used by government to engage. There is also a goal to move agencies from competing to sharing - although I believe this will continue to be a challenge for all Australian governments while budgetary approaches and Ministers remain competitive and focused on their own interests ahead of whole-of-government. The plan also outlines the intent to move from risk averse to risk managed behaviour and from large monolithic projects to rapid prototyping, with a multi-disciplinary design approach rather than a technology driven one. This is also a challenging change for governments due to cultural and structural reasons and I will be interested to see how South Australia intends to achieve this. coordinate multi‑disciplinary teams made up of staff seconded from agencies, and people drawn from industry, academia and the community. DemoLab will use the best technical, operational, and behavioural thinking to address specific challenges and opportunities. Project teams will spend no more than thirty days developing small‑scale, operational prototypes of their solutions. Lessons will be learned, connections made, and successes will be recorded and replicated across the public sector. I think this is a great idea - a government, like any other organisation, that doesn't reinvent itself will be reinvented from the outside, a far more unpleasant and messy outcome. The positioning paper is written in a very conversational style (unlike many government papers - or most ICT plans), and is well worth reading and commenting on. 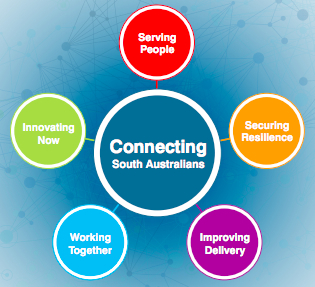 So if you want to have some input and influence over the South Australian government's future ICT strategy and aspirations, visit the SA Connected consultation. Hi, what a great web blog. I usually spend hours on the net reading blogs on various subjects. And, I really would like to praise you for writing such a fabulous article. I honestly believe there is a skill to writing articles that only very few posses and yes you got it. This is really informative and I will for sure refer my friends the same. Thanks.